Dog Sleeping Positions: Are There Hidden Meanings to Your Pup’s Resting Pose? 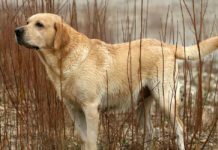 Home Labrador Facts & Fun Dog Sleeping Positions: Are There Hidden Meanings to Your Pup’s Resting Pose? 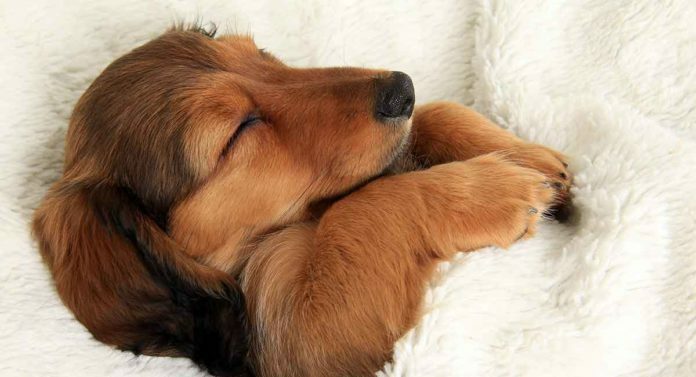 Are there really hidden meanings behind dog sleeping positions? Many people think so, and dozens of articles have popped up around the subject. These articles tend to say much the same thing, though they sometimes use different names for the sleeping positions. But is there any truth to them? Currently, there is almost no scientific research on dog sleeping positions, so it is difficult to provide reasons for why your dog sleeps in certain positions. 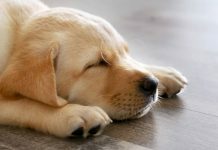 However, there is plenty of information regarding animal behavior and biology that can help us understand some of what is true and false in all of these articles about dog sleeping positions. Ever since I saw the meme of dogs being compared to bagels, this has become one of my favorite dog sleeping positions. Most articles on the web describe this position as one that protects vital organs and provides warmth, and they’re not wrong. If you look at a photo of a dog’s anatomy, you will notice that aside from their lungs and heart, just about everything else is located in their bellies, right past the rib cage. Just like humans, that belly is protected by flesh rather than bone. Therefore, curling up nose to tail does better protect the underbelly (and thus organs) more than other dog sleeping positions. Furthermore, the dog’s ancestor and closest living relative, the wolf, is also known to use this position to stay warm, so it’s not too much of a stretch to assume dogs might do the same. However, it is unlikely that your dog feels unsafe enough to purposely protect his organs in your home, so this position is probably just comfortable for him. Why Do Dogs Sleep on Their Back? Perhaps one of the silliest dog sleeping positions is when they lay on their backs with their paws in the air. Most articles say that dogs who sleep on their backs might be warm. They talk about how dogs have less hair on their stomachs and sweat glands in their paws. Thus, laying on their backs and extending their paws into the air helps them cool down. It is true that dogs have sweat glands in their paws. 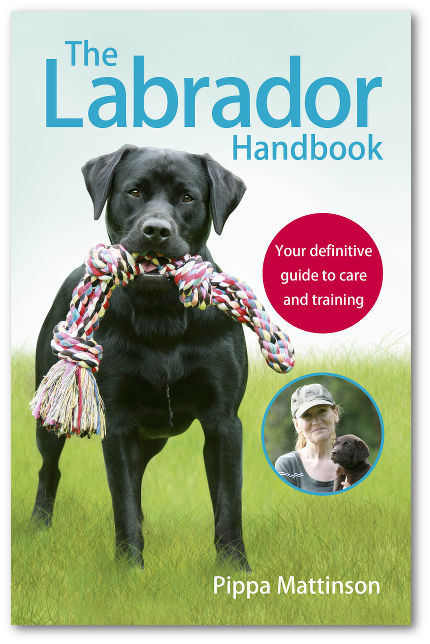 However, dogs rarely sweat through their paws (or anywhere else) and sweating is not a method they use to stay cool. As you know, dogs cool down mainly by panting. Panting is considered a method of evaporative cooling because when a dog pants, moisture evaporates from the tongue and lungs. Dogs bodies’ also use vasodilation. 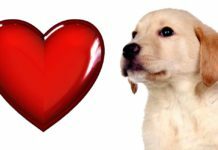 Vasodilation is when blood vessels near the surface of a dog’s skin expand, which helps blood to cool before returning to the heart. Though the argument that dogs sleep on their back because they are too warm may seem logical, it is most likely not true. You will know if your dog is hot because he will be panting, and his face and ears will feel warm. Personally, I have never seen any of my dogs laying on their backs when they’re feeling warm. Instead, they lay in front of the AC vent. Usually, a dog lays on her back for attention (mine likes belly rubs) or in submission, but some may just find it comfortable. Another reason dogs lay on their backs to sleep is brachycephaly. Brachycephaly occurs mostly in flat-faced dogs, like the French Bulldog, and complicates their ability to breathe. Therefore, a brachycephalic dog may sleep on its back in order to breathe easier. Why Do Dogs Sleep on Their Side? Articles about dog sleeping positions have described dogs who sleep on their side as “easygoing” and “relaxed,”. They say that these pets likely feel safe and comfortable because this position leaves their vital organs exposed. While it is true that laying on their side leaves their organs exposed, the rest of it sounds a lot like a horoscope. My 1-year-old German wirehaired pointer sleeps on his side all the time, but I would not consider him easygoing or relaxed. He’s more mischievous, playful and energetic. As far as safe and comfortable goes, this may not be 100 percent true either. I recently took my dog to the vet’s office, a place he hates very much. Every time we go, he exhibits excessive stress panting for nearly the entire duration of our visit. I noticed that at one point, as we sat in one of those tiny, sterile, windowless rooms waiting our turn, he laid down on his side. Stress panting as he was, I highly doubt my dog was feeling especially safe or comfortable. Because it is difficult to find trustworthy information on the topic of why a dog might sleep on his side, I decided to look to their ancestors, the wolves. Wolves sleep on their sides sometimes, but the behavior of laying down this way can also be a display of submission to a dominant wolf. They make their vital organs vulnerable to that wolf to show that they know their place and mean no harm. Wolves may also lay down on their sides as a way of surrendering after a standoff. The behavior is risky. It often helps packs avoid fights but can sometimes result in the wolf giving his enemy an easy kill. Most dogs will be comfortable in their homes unless they are new to it and/or have had a past of abuse. Therefore, there isn’t much merit to saying a dog that sleeps in this position feels safe. In fact, as long as a dog is in a loving home, it likely feels this way no matter what position it is sleeping in. Why Do Dogs Sleep on Their Stomachs? Some articles will list a couple of different dog sleeping positions that involve lying on the stomach. For instance, the “Superman” is when the back legs are splayed out behind the dog with the paw pads facing up. However, aside from a description of personality, the reasoning behind a dog doing the superman versus a more normal version of sleeping on the stomach does not really differ. Therefore, we’ll talk about stomach sleeping in general rather than splitting it up into different categories. This position is believed to be used by dogs when they are alert in some way because they can rise more quickly and easily than from any other position. Therefore, dogs who sleep on their stomachs are described as either not wanting to miss out on any action or as feeling unsafe in their environment. As far as the former goes, I have seen my own dogs lay this way when waiting for a morsel of food to drop at supper, but there aren’t many studies on this sort of behavior, so we can’t completely confirm this one. As for the latter, there have been studies done on animals, such as mink, that suggest this position is used by animals in distress. It does allow for quick mobilization and thus may be used when an animal feels threatened or unsafe. Another of my favorite dog sleeping positions, cuddling is thought to be a show of affection or a way to keep warm. Dogs typically cuddle back-to-back or in a spooning position with both humans and other dogs. If you’ve ever cuddled with your dog, then you’ve probably noticed that their bodies give off heat similar to humans. Therefore, it is possible that a dog may be cuddling for warmth. However, it’s more likely that they find the warmth pleasant rather than because they are cold. Most dogs are pretty good at keeping warm on their own. As far as affection goes, there has always been a long running debate about whether or not dogs can feel such emotions. Many scientists are reluctant to say dogs love us and prefer words like “attachment” instead. However, one scientist (and dog lover) named Gregory Berns was able to scan dogs’ brains with an MRI. What he observed suggested that dogs have the potential to feel empathy. If dogs indeed are capable of such a deep emotion, then why not love? Berns also pointed out that a dog typically has no reason to cuddle with a person for warmth, considering they have other alternatives. And a dog cuddling with her owner doesn’t traditionally come with extra meals or treats. Therefore, though there is still more research to be done on the topic, it definitely seems possible that your dog is cuddling with you or other dogs out of affection and a desire for closeness. The meaning behind dog sleeping positions has seemingly gone unstudied in the realm of science because there are virtually no scientific papers on the matter. However, we can study the behavior of dogs and related animals, like wolves, to try and learn more about why dogs sleep the way they do. 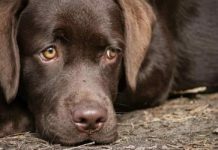 To some extent, there are reasons for why your dog might sleep in a certain position that go beyond just wanting to be comfortable. 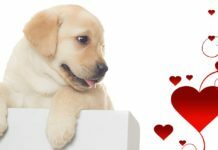 However, it is unlikely that dogs living in a loving home are purposefully choosing positions to protect their organs or keep them alert to threats. Instead, most dogs will feel secure enough to sleep in any position they please. Carrier, C.A., Seeman, J.L., and Hoffman, G., 2011, “Hyperhidrosis in Naïve Purpose-Bred Beagle Dogs (Canis Familiaris),” Journal of the American Association for Laboratory Animal Science. Goldberg, M., Langman, V.A., and Taylor, C.R., 1981, “Panting in Dogs: Paths of Air Flow in Response to Heat and Exercise,” Respiration Physiology. Owczarczak-Garstecka, S. and Burman, O.H.P., 2016, “Can Sleep and Resting Behaviours Be Used as Indicators of Welfare in Shelter Dogs (Canis Lupus Familiaris)?” Plos One. 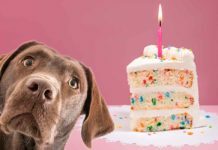 Previous articleWhy Do Dogs Chase Their Tails?